The Texas (TX) Lottery is a state-owned, government operated, lottery for the state of Texas in the United States. Established in November 1991 and running since May 1992, this lottery is dedicated to good causes such as supporting education, veteran services and crucial state programs. It offers a wide variety of up to 10 different games and can be accessed via mobile. However, it is the subject of a number of complaints from a number of players and tickets cannot be bought anywhere else but from authorized retailers. Despite operating since 1992, it is only believed to have entered the big league of lotteries in 2003. It currently includes playing the following games Powerball, Mega Millions, Lotto Texas, Texas Two Step, Texas Triple Chance, All or Nothing, Pick 3, Daily 4, Cash Five, and Scratch Tickets. As required by most US lotteries, players have to be above 18 years. 63.1% of ticket sales are allocated to the prize winnings with 27% going towards education and 9.5% going towards expenses with 0.4% of unclaimed winnings are allocated to Veterans. Details on the lottery are available on the website and through the app. Games are easily accessible on the website as well as winning numbers and other vital information. 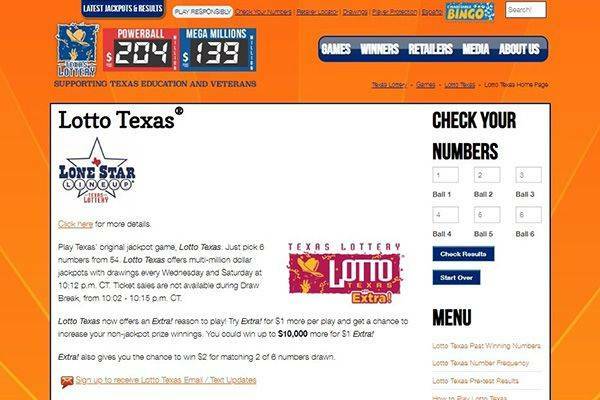 Each game has a dedicated page on the Texas Lottery website to help players with all the vital information necessary for playing the game. Each page breaks down the lottery games. It is only available for play within Texas but ticket prizes are low and players are guaranteed a minimum win in some games. The Texas Lottery is available for androids and iOS devices and can be obtained from Google Play and the Apple App Store. It allows players to check any of their tickets to determine if they won at any time and for any game. It also allows players to scan the barcode on their draw game and check their scratch tickets to determine their win status. Other features include being able to pick and save lucky numbers, create plays, get updates on jackpots, check winning numbers, and promotional second-chance drawings. It also lets players find retailers and favourite scratch tickets. There is a Texas Lottery Cowboys Promotional Second Chance Drawing in which your chances of winning are increased by the number of entries into the game and the prizes being given away. Tickets can only be bought from authorized retailers who can accept cash, check or debit cards at their own discretion. 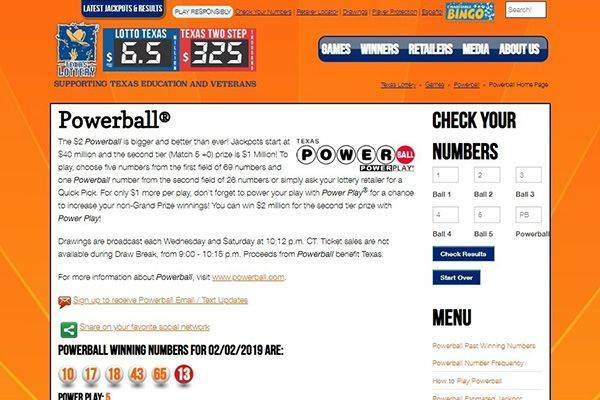 Lower tickets are exempted from taxes and cash prizes of up to $599 can be gotten from any of the authorized retailers while those above have to be gotten through the main Texas Lottery Claim Center. There is also the option to obtain prizes by mail although the risk of doing so is on the player and the Texas Lottery Commission will not bear any responsibility for any losses that arise from it. Players can choose whether to receive grand prizes by lump sum or inform of an annuity. Prizes have to be claimed within 180 days of the win. 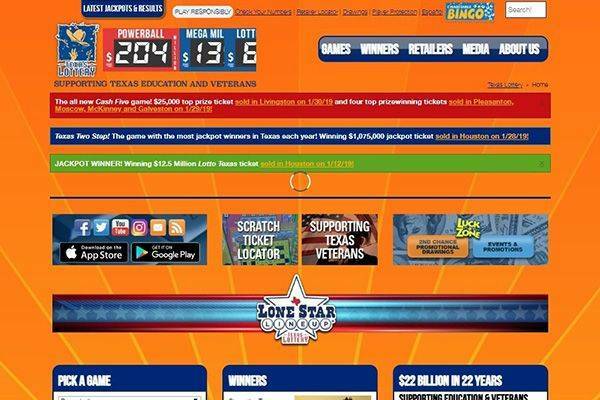 Texas Lottery has an FAQ help page for users to quickly reach answers to the most common issues raised by other players. This is nice as first level support, but cannot replace a more custom solution. Just as with other official lotteries, live chat is noticeably missing. This is something we came to expect from online services that deal with private details and payment method details. 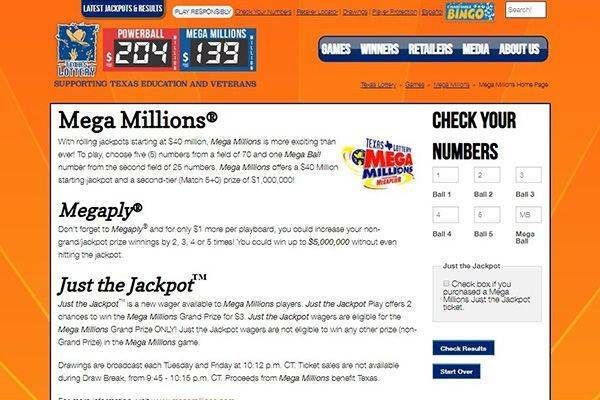 IS TEXAS (TX) LOTTERY LEGIT? 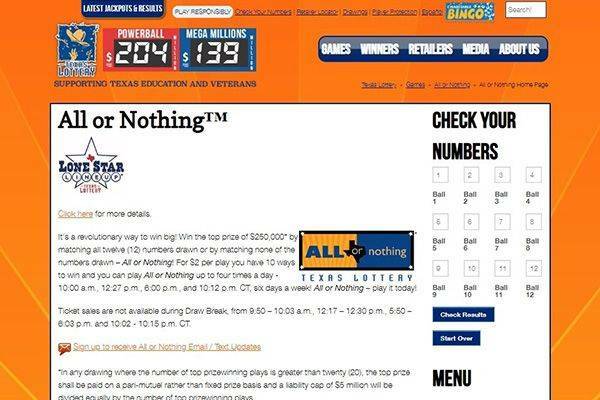 The Texas Lottery site is official and therefore does not carry any accreditation from other sources. 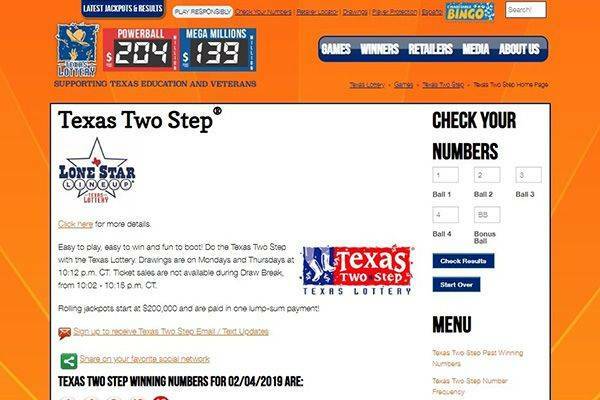 There have however been complaints by players that the Texas lottery is rigged or manipulated to limit wins and favor certain parts of the state over others. Many consider it manipulated and although it is official for the state of Texas, it is only recommendable to those who understand the lottery and their chances of winning. On a scale of 0-5 we would rate it a 3. The Texas State Lottery is the official state lottery for Texas and contributes to important services within the state including education, and veteran services. While it is a good cause to play for, it is not easily won.